Chamber of Commerce Wants Your Input! 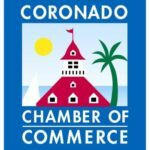 If you are a business owner or manager in Coronado, the Chamber of Commerce wants to hear from you regarding parking. The City of Coronado currently requires take-out, or counter-oriented eating and drinking businesses to follow the same parking rules as regular restaurants where you sit at a table while consuming a full meal. The rule is for every 100 square feet of customer space, the business must provide one off-street parking space. This parking requirement is established in the Orange Avenue Corridor Specific Plan which was adopted in 2003 and does not apply to businesses established before that time. The Coronado City Council discussed off-street parking requirements for counter-oriented eating and drinking establishments during a public hearing on December 4, 2018. After debating the matter, the City Council voted to “grandfather” all existing counter-oriented businesses that do not meet current parking requirements. The City Council also directed staff to seek input from Coronado stakeholders on whether further changes should be made to parking requirements for counter-oriented eating and drinking establishments. This survey was designed to collect opinions from the business community. Please take a few minutes and provide your feedback by January 30. We appreciate your input!